For thousands of years the birthday cake remained relatively unchanged. Whether it was for a kids’ birthday party or an adult’s quite family birthday celebration at home, the birthday cake usually consisted of a round or rectangular chocolate or white cake with chocolate or vanilla frosting. Sure, the color of the frosting might have varied from cake to cake and what was stuck in the top of it as decoration certainly were tailored to the individual’s likes. But that was the amount of evolution the cake went through. With the popularity of baking shows and designer cakes the only thing limiting the evolution of the kids’ birthday cake has been the imagination of the baker creating it. While we thought we were getting close to seeing everything, we were pleasantly surprised by a take on the birthday cake we came across on Food Beast’s Instagram account. Yep, that’s right. It’s a birthday croissant. We’ll let the Food Beast tell you about the details as we marvel at this amazing feat in birthday cake engineering. 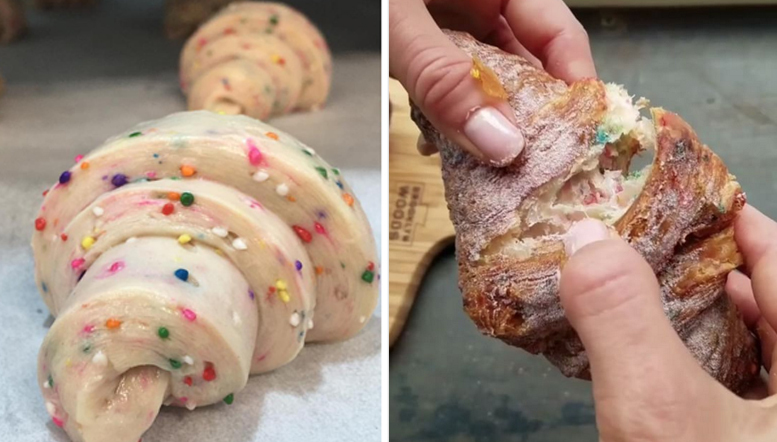 The #BirthdayCakeCroissant is Chef Thiago’s (@chef_thiago) latest innovation. The croissant is being dished out of the Union Fare Restaurant (@unionfare) in NYC where he’s running the bakery and channelling all the desserts. In this video, we see our main gal Jess (@CheatDayEats) busting it wide open. “He’s a genius,” Jessica tells us. It’s not extremely sweet, “I was kinda surprised. He mixed the sprinkles into the batter, which [Thiago] says has never seen anyone else do." So if your young one has discerning tastes and you’re feeling adventurous maybe you ordering a few birthday cake croissants instead of a conventional birthday cake is the right move for your next kids birthday party.